Opened in 1960, the Bognor camp was the first of the postwar camps to be built in mainland Britain. Occupying 60 acres it was located a short distance east of this popular holiday town on the south coast of England. Flooding caused by heavy rain had made building difficult so when the first campers arrived the camp was not quite finished. They were offered alternative accommodation at Clacton, many took up the offer but a few also stayed and helped fix doors and window frames. Billy Butlin gave each camper a free bottle of Champagne. When completed it could accommodate around 5,000 campers and another 5,000 day visitors. 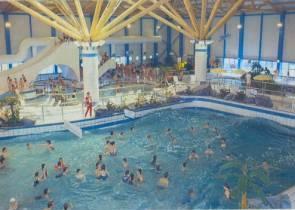 After escaping the first round of closures in the early 1980s the camp underwent a £16 million facelift in 1987 and was renamed Southcoast World. In common with the other Butlin sites the investment included new and updated accommodation as well as a new indoor water complex. Bognor also survived the second round of closures (despite many local rumours) and is now one of only three camps left in the Butlin's empire. A second investment program was announced in 1998 and a further £45 million was pumped into the site. 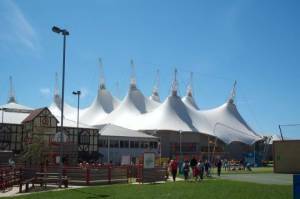 In common with Skegness and Minehead, the centrepiece of the new development was a large undercover structure known as the Skyline Pavilion. This enables many of the facilities to be placed under cover and allows for year-round operation. The refurbishment also included updating the chalets ("apartments") and giving the famous Redcoats a new designer outfit. The centre was re-launched by pop star Ronan Keating in May 1999. Following on from the Bourne Leisure purchase of Butlins from Rank in 2000, the Bognor centre has continued to change and be gradually updated. In 2005, further work was undertaken to update the camp with the introduction of the Shoreline Hotel. £10 million was spent on the hotel and its surrounding landscaped gardens. With big porthole windows, and a ship-like prow, the four-floor hotel was designed with a slightly nautical feel. The hotel provides 160 rooms of three different grades, each including hi-tech equipment and luxurious furniture. Guests staying at the hotel can enjoy the sea-views, room service, modern bistro restaurant and cocktail bar, in addition to the regular Butlins facilities. The addition of the "Shoreline" unfortunately meant that part of the York building was demolished to make way for a car park to replace the one on the site of the new hotel. 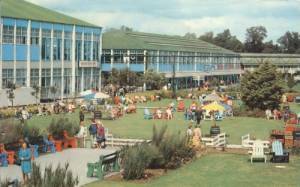 Shortly after the opening of the hotel, the Green Baize snooker room opposite was converted to the Shoreline Conference centre, marking a new direction for Butlins. Following on from the success of the Shoreline, the Ocean Hotel opened in August 2009 on the site of the old boating lake. The Ocean Hotel features a disco lift, allowing guests to travel between floors in style, and a Spa which features, amongst other things, a snow cave and a disco shower. Building work for the Ocean Hotel included the demolition of the former reception building and of the outside pool, changing the look of the front of the camp and with the sports green being landscaped in the process. With both hotels proving popular, construction of the Wave Hotel began in 2011, with the hotel opening in July 2012. Chalets in Oyster Bay (formerly West Camp) have been demolished to make way for this hotel with the eventual plan being that all Oyster Bay chalets will be replaced with hotels.